Mango is name as the king of fruits and mango season has already come. So, start making mango pickles, chutney, dessert, raita and many more with Mangoes during this season. 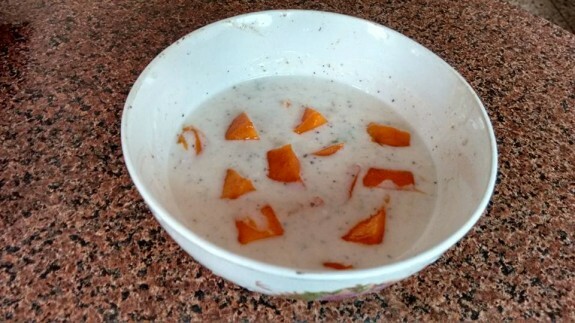 The Mango raita is a healthy dish and can easily be served as a side dish with roti, naan, rice in your meal. The sweet taste of mango and the tangy taste of yogurt go very well with the refreshing mint burst that enhances the total taste of this delicious mango raita. 1. Peel and chop the mango into small pieces. 2. Take a bowl and whisk the yogurt to make it a smooth one. 3. Chop the mint leaves and add it on the yogurt. 4. Add roasted cumin powder, black pepper powder, salt, sugar and chaat masala and mix everything well. 5. Now, add the chopped mangoes and mango pulp and mix gently. 6. Chill it on the refrigerator and serve it with roti, rice or naan.